Spring has sprung and Easter is right around the corner causing a few more temptations for our animals to chew, lick, and possibly even ingest items that are not particularly safe for them. 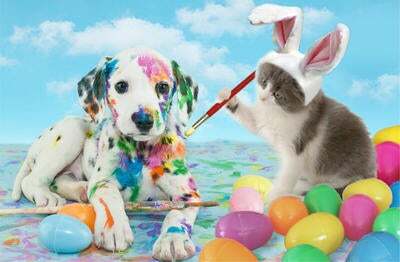 Before you start your spring cleaning and decorating for Easter, remember to take a few extra steps to keep your pets safe, happy, and healthy. It may be common knowledge that chocolate and candy are no good for our animals, but it never hurts to repeat it. Chocolate contains theobromine and can cause elevated heart rates and seizures. Certain candy also contain the sugar substitute xylitol, a sweetener that is toxic to animals. If ingested, it can cause seizures and liver failure. It is best to keep the Easter candy hidden away and out of reach of your furry friends. While Easter lilies are very pretty, they are also severely toxic to cats. If ingested or even just simply by chewing on them, these flowers can cause vomiting, lethargy, and even death. If your cat is a master jumper and can reach just about every surface in your house, it’s highly recommended to steer clear of Easter lilies to ensure your cat safe and healthy. Don’t lose track of where you hide all those Easter eggs! Real or plastic eggs can be mistaken for treats by your dog. Fake eggs can cause intestinal problems if ingested while real eggs that may have been forgotten about can spoil and cause upset stomachs and diarrhea. Keep track of the number of eggs you hide in your yard as well as where they are hidden to gather up any undiscovered ones after the hunt is over. Draw yourself a map to help you remember where you’ve hidden all the eggs! Easter baskets can also be harmful to animals. Between the Easter grass, the candy, and any toys that may be present, these items can cause some serious issues if your furry friends find them first. If Easter grass is chewed on and ingested it will cause irritation and blockage to their digestive system. Try using other alternatives to Easter grass such as tissue paper or floral fabrics. If your furry friend tends to tear up paper products we highly recommend sticking to fabrics to fill in your baskets. Dogs may mistake the Easter toys meant for kids as their own. These plastic toys are especially dangerous to dogs because chewing and swallowing any plastic pieces can cause intestinal blockages and upset stomachs. Crowded houses with friends and family can be overwhelming to your animals. Consider giving them their own space away from all the potential chaos with food, water, and a few of their favorite toys. It will help keep your pets calm but also helps reduce the risk of them eating or getting into things they shouldn’t be. In regards to spring cleaning, always make sure that cleaning supplies are out of reach from your animals (and children too). Remember that spring is also a time for bugs to come back with a vengeance so it is recommended to set up an appointment as soon as possible with your veterinarian to discussion flea and tick prevention. You should use this time to discuss heartworm prevention as well. Even if you have an feline who stays indoor, it is important to keep them protected because you never know what you or another pet may bring into your living space. While we are on the topic of indoor cats and spring, it is also recommended that you microchip all your animals. Warmer weather can make it more enticing for animals to run off so having a microchip with your current information will make it that much easier to bring your pets home safely. Spring is here and Easter is wonderful but remember your pets are always curious about new things and smells no matter what day of the year it is. Keep an eye on your furry friends and call your vet when something doesn’t seem right. Warmer weather is in sight so be sure to enjoy it with your pets in a productive and safe way.